Oracle is fighting a bitter legal battle against Google because of Android. They are charging Google of willfully violating Java patents which they acquired when they bought Sun Microsystems. Before Oracle bought Sun Microsystems, Sun and Google were going along quite fine. When Google announced Android back in 2007, Jonathan Schwartz, the CEO of Sun Microsystems at the time, wrote a blog post congratulating Google. I just wanted to add my voice to the chorus of others from Sun in offering my heartfelt congratulations to Google on the announcement of their new Java/Linux phone platform, Android. Congratulations! Today is an incredible day for the open source community, and a massive endorsement of two of the industry's most prolific free software communities, Java and Linux. Of course, a blog post from the CEO of Sun Microsystems himself congratulating Google on Android is totally unacceptable to Oracle. If the judge came to know that Sun Microsystems had no problem with Android, it might affect the $6 billion that Oracle is hoping to get from Google. So, as noticed by Jay Greene of Cnet, Oracle has decided to hide what happened by removing all of Schwartz’s blog posts. Until recently, Schwartz’s blog post published on November 5th, 2007 titled “Congratulations Google. 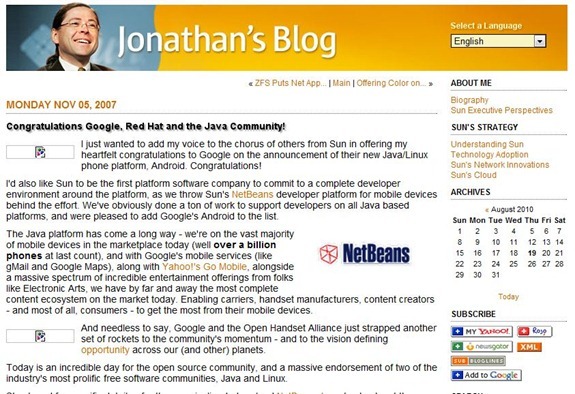 Red Hat and the Java Community” could be found at http://blogs.sun.com/jonathan/entry/congratulations_google. After the acquisition of Sun Microsystems, the URL was redirected to http://blogs.oracle.com/jonathan/entry/congratulations_google. However, if you check either of the links now, you will get a 404 page. Thanks to Internet Archive’s Wayback Machine, the blog post can still be viewed. 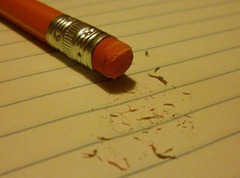 Oracle did not remove just that blog post – all of Schwartz’s blog posts has been removed. I am not sure if the removal of Schwartz’s blog posts will have any effect on the case against Google though. Google included it in its defense. So, no doubt they would have taken hard copies and archives of the page. But will it constitute evidence tampering? Regardless of whether it will affect the case or not, one thing is clear – Schwartz’s blog post is extremely embarrassing for Oracle and they do not want the public to see it.